If you listen to my podcast or follow me on twitter, you will know that I was excited for this show. 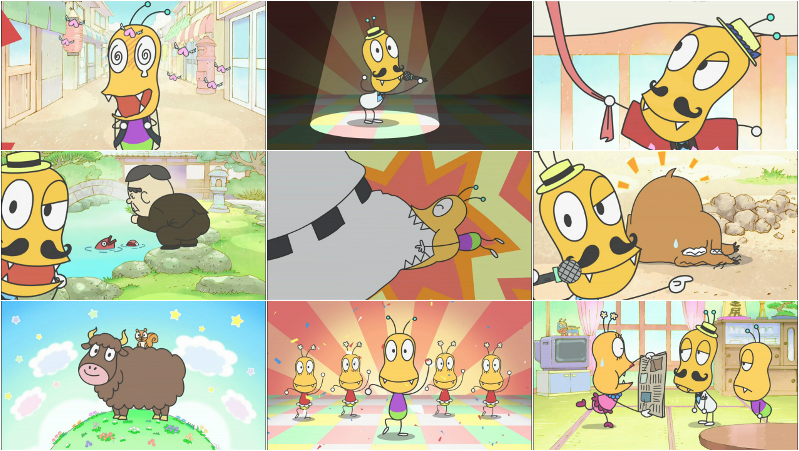 A show based on a 2007 Minna no Uta music video by Uruma Delvi, about bean headed bugs that bite bottoms. The show follows 10 year old Bottom Biting Bug XVIII and his family and friends in 5 minute bottom biting based adventures. It is even better than I was expecting. The mixed media look of the opening reminded me somewhat of Koji Nanke, and effectively sets the show’s tone in 15 seconds. The stories have a relentlessly logical approach to an absurd concept. In the world of Bottom Biting Bug, there are a bugs whose job is to bite bottoms. It is a service industry that provides a way to pep up the individual whose bottom is bit. Taking this as FACT, the show then explores that absurd concept. How do you market this service? How do you get better at it? What are the hazards involved? ALL THESE QUESTIONS WILL BE ANSWERED. Furthermore they will find an excuse to segue into a sequence inspired by the original music video EVERY EPISODE. While your bottom won’t be bitten while watching it, your brain will not escape the earworm. All in all a great addition to watching Poyopoyo on Crunchyroll when you wake up on a Sunday morning. And certainly better than any of the other new anime I have seen so far this autumn.